Before we get started with the geekly goodness, I want to mention that some readers seem to be skeptical of my claims that reading these bulletins will "make you 146% smarter." In truth, the 146% figure is just an AVERAGE. I collect this data by tapping into the NSA's webcam, audio and keystroke data streams of those who are viewing the Geekly Update page. A proprietary algorithm (powered by my TI-58 calculator) analyzes that data (which includes facial reactions; vocal cues such as "whoa", "cool", "awesome" and "no way! "; and the statistical distribution of the frantic keystrokes that result) in real time. Google has filed a patent on tattoo-like technology whose circuitry, when applied to the throat, implements lie-detection. Used to be a telltale smear of lipstick did the trick. Monkeys may have provided an important breakthrough for scientists working on brain-controlled prosthetic limbs. Check out this video showing monkeys using brain-machine interfaces to control their on-screen avatars. Google (AGAIN?) has finally broken its silence about the barge floating in San Francisco Bay. It is not intended to be a floating data center, alien experimentation lab, and certainly not a Google hardware store, no sir; “we are exploring using the barge as an interactive space where people can learn about new technology," the statement read. If only there was a memorable five-letter word for such an innovation. Upon learning that the NSA has reverse-engineered many of Yahoo’s and Google’s networks in order to monitor international traffic, the latter did what any reasonable business would do: it encrypted its networks. For some reason, this is a shining example of corporate heroism. Pass a Rorschach test, get access to your online account. That's the latest password security scheme from computer scientists at Carnegie Mellon University, who are hoping to mitigate that damage caused when security breaches result in millions of passwords being exposed. Who would have guessed? Charities using Facebook to connect with the public are finding that people feel just as good about clicking the Like button, as they do about actually making a donation. One study asserts that Facebook turns people into slacktivists -- who associate with a cause without committing any resources to support it. Google Glass is adding music features such as a Shazam-like song identifier and earbud ports. Also new is voice search: “OK, Glass, listen to…” the sound of the nice young men in clean white coats coming to take you away, ha-ha. For the first time U.S. Bittorrent traffic, synonymous with “piracy activity,” fell an amazing 20% to 7% of all Internet traffic during the past six months, according to the BBC. Of course, that’s only a drop of about 1% of all Internet traffic, but the mainstream media has to make it sound dramatic. Meanwhile Netflix and YouTube account for 50% of all traffic. These stats suggest that people who appreciate quality movies are a dwindling minority. Android smartphones have an 80 percent share of the market for new phone sales, according to IDC’s latest quarterly market analysis. Windows Phone garnered 5 percent of the market, while Apple’s iOS slipped slightly. And lest we forget this week’s special theme: Google Mail users no longer have to download file attachments. They can be saved directly from Gmail’s mail server to Google Drive’s server, which is probably on that barge out in the Bay. Most recent comments on "Geekly Update - 13 November 2013"
EDITOR'S NOTE: Indeed, five Bonus Points are awarded for each comment! Bully for Google. Eh, what! Though as much as it sounds as though they are on our side, something knaws in my head. Oh well! Every little helps. On a similar track, a couple of little brits were able to decypher nazi cryptic machines. So how long should it take the NSA? Best regards, john. "These are puzzles that are easy for a human to solve, but hard for a computer to solve. I don't know why I am in this doubting mode but a certain chess game jumps to mind. Best regards, john. Really enjoyed this week(ly)geekly. Best regards, john. I've been listening too; but I never heard those nice young men coming, in their clean white coats- Aha- I'm hearing that's the "Real Meaning". Now those Goo-geeks f-float t-too quietly across the b-bay in a Goo-Glass b-bottomed b-bargee. Now, if you're awarding bonus points for each comment; my smartness must now be officially (x+5)%. Although as I won't expose myself to the world on BaceFook, I may never achieve a rating in slacktivism. I tweet you not, neither, know-how! As for "hitting the Like button" on Facebook, I don't do that. Why? It really messes with your Newsfeed and the "clowns" come out from Facebook, everywhere. My dear Bob, is there no end to your apparent insatiable and encyclopaedic knowledge which you impart with much aplomb and frequency? However,for the sake of balance and feeble attempt at humour - to quote a saying I either heard or read probably about 50 years ago, 'If you're so smart why aren't you a millionaire - more likely a billionaire in todays money'? Seriously though I cannot express appropriately my profoundest respect and regard in which I and doubtless many hold you. be happy to see those nice youn men in their clean white coats! Bob, 146% smarter cannot possibly be accurate for everyone. For example, let's say a ten-year-old is reading this who has ten years of life experience compared to an 80-year-old who is reading this who has 80 years of life experience. If the time to read the above article takes...let's say...five minutes for each of our test subjects, then 5 minutes out of 5,256,000 minutes for our ten-year old subject would equal a learning experience of n% and 5 minutes out of 42,076,800 minutes for our 80-year-old subject would equal a learning experience of x%. Now, my calculator can't display a number that small for either a or x but I can tell you that they will be far from being equal. Of course, this does not take into consideration the variables thrown in for each test subject such as when each subject became cognizant of themselves and started to learn, each of the subject's learning capacity, the amount of time each subject took to learn throughout their lifetimes, etc. Please correct me if I am wrong. "These stats suggest that people who appreciate quality movies are a dwindling minority." Bob, not sure what you are trying to imply here. I have Netflix with Comcast high speed internet service. I stream movies in HD that look nearly as good as Blu-Ray. Meanwhile, people who use a bit torrent means to get movies tell me that the quality is really suspect. It's a crap shoot as to what you get. I'll stick to streaming movies, thank you very much. Argh! I must be part of that "4% actually get dumber" crowd because I am not able to figure out the reference to the "If only there was a memorable five-letter word for such an innovation." I used to be really good figuring out those 4-letter words but getting dumber by 4% may even be taking a toll with that ability anymore. Oh, btw, are those smarter/dumber percentages a daily figure or a yearly figure? DONNA IN IOWA ---Bob uses a TI-58, clearly not quite up to the task at hand. 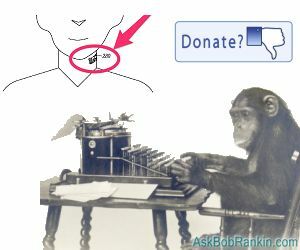 I use a TI-59 and find that Bob has a 'p' value (sorry Bob) that makes P=1. It's why he's always right. My TI-59 places him just a tad below 'always' (P=.900000000000001). He was simply just too lazy to pull down the "Students T Book" to look up the right numbers to use. We don't want him working TOO hard figuring out that he's always right. Or NEARLY always Right. Those who average it out are the ones who have let doubt about his infallibility creep into their minds, otherwise we'd ALL be TWICE as smart. So . . .. let's ALL thank the SLACKERS here who don't finish reading his remarks, follow his links, or think "yeah, right." -- without them we'd be twice as smart. Your Friends you forward one of Bob's posts to????... Are you SURE you can trust them to read it? If not - there's another one of your problems. Besides his flawed TI-58 (why fix what's not broken?, thus the TI-59, and never another TI 50's series produced, they'd reached perfection). So you bear some of the responsibility too. Sorry Donna, finish what you start reading, foward ONLY to those who will FINISH reading Bob and following his links, and Bob, get a LIFE! -- GET A REAL TI, the one that has all he bugs worked out of it . . . .you know like the TI-59 . . . ..